I guess that at the end of the day, even though I’ve never been to Italy and tasted authentic regional cuisines, I love Italian cuisine. Especially pasta! I know there are many talented Japanese chefs in Japan who worked in Italy for years and they make amazing food, but I still need to travel through Italy to see for myself how authentic the Italian food I know (especially from eating in Japan) is. A cucumber, tomato, feta and chickpea salad (lemon and olive oil vinaigrette). Not Italian or seasonal but was craving it! 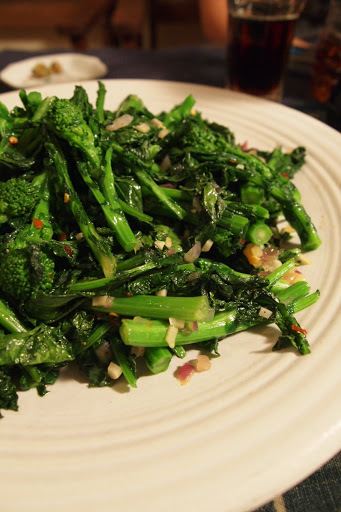 Broccoli Rabe with garlic, red onion and red chili flakes. I made this every day during my externship at Del Posto. You would think I got sick of it but I’ve truly come to appreciate the bitterness of broccolii rabe. Vegetarian Lasagne (shiitake, portobello mushroom, eggplant, zucchini, swiss chard, ricotta and fresh mozzarella). 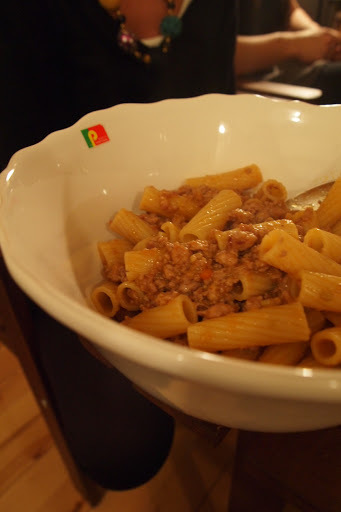 Rigatoni with Bolognese (veal and pork).